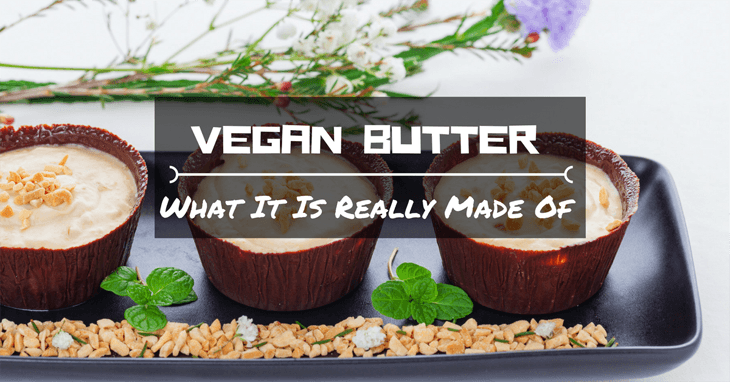 →Vegan Butter: What It Is Really Made Of And How You Can Make It. So, vegan butter. These two words sound like an oxymoron, right? Well, in some cases, it would be. Real butter is made from milk, typically cow’s milk, but it is not uncommon to be made from goat or sheep milk as well. First, the cream is separated from the milk, then it is churned to make it thicken. So how would vegan butter be made without the milk? Most everyone knows what vegan means, or at least has some idea of what it entails. It means you do not eat or ingest any animal products, of any kind. No meat, no dairy. Now, for some of us, this may sound like a hungry way to live. However, veganism has been around for a very long time. There is proof that people have chosen this way of life for at least the last 2,000 years. In all of that time, it’s no surprise that someone figured out ways to make copycat foods, i.e., vegan butter. Vegan butter is a butter substitute that is completely void of animal products. It should have the same or a similar taste and texture of real butter, but without any animal byproduct in it. It is made from oil instead. Usually some vegetable-based oil such as olive, corn, canola or soybean is used, although almost any type of cooking oil should work. The type of oil used can alter the flavor of the butter. You can buy vegan butter at almost any retail grocery store, or from online sources. Different manufacturer’s make their products differently so what ingredients are used will depend on them. In some cases, fermented juices from either beets or corn are also added to the oil to give it the creamy but solid texture. No matter what the butter is made from, it should have the same texture as real butter and be able to replace butter in recipes such as cakes and bread. There is something to keep in mind when using vegan butter, especially in recipes. It is not made from the same ingredients. Therefore there is a slight chance of it changing the outcome of the recipe. If the butter was made properly, it might just change the taste, and if so, it should only be a slight difference. You may not even be able to notice the difference. However, in some products, the texture may change as well. Making vegan butter at home is super easy.You only need a few ingredients and a blender or food processor and, of course, a recipe. Here are two recipes and a video you can use to make vegan butter at home, either a solid or a creamy spread. Then you can decide if you want to use it or buy it premade. 1. Mix almond meal, yeast, vinegar, non-dairy milk and salt in a blender until completely smooth. There need to be absolutely NO chunks or grainy bits. 2. Add coconut and olive oils, turmeric (if using) any added flavorings and blend on high until light and airy, but still slightly liquidy. Depending on your blender power, this may take a few minutes. 3. Pour into a container and allow it to set. It may take a couple of hours, but you can use the freezer to hurry it along. 1. Whisk together the non-dairy milk, apple cider vinegar, and salt. Set aside for 10 minutes, allowing to curdle. 2. In a food processor mix oils. Add in the remaining ingredients including milk mixture and any extra flavorings. Process for 2 minutes, scraping sides occasionally. If your processor gets too hot, the butter may become too soft and runny. Process in bursts to avoid this if necessary. 3. Once it is completely mixed and has a creamy texture, put it in a storage container and either refrigerate or use immediately. This recipe can be frozen if needed. Vegan butter is not only for vegans. Anyone can use it and probably should. It is much healthier for you than butter made from milk. If you have an allergy to milk or milk products, vegan butter can make a perfect substitute. You can use it in any way that regular butter can be used, even on toast or bread. Besides, making your food homemade allows you to keep a check on what goes in your body. With all of the new hype out there about GMO’s, gluten and fake ingredients, it never hurts to know what you are eating.